The LETTERING / MARKINGS are INDEXABLE to the CORRECT POSITION! The SOCOM USC 45 Fake Silencer slides over your barrel and is held on by 3 nylon tipped set screws. The nylon tipped set screws will not dent your barrel as much as the steel tipped set screws do. This is High Temperature Nylon so they will NOT melt. If you want steel tipped set screws all you have to do is pull the nylon tips off. The above photos shows the MFI SOCOM Fake Silencer for the Heckler and Koch (HK) USC45 Carbine to give the look of a suppressed H&K UMP 45 submachine gun. 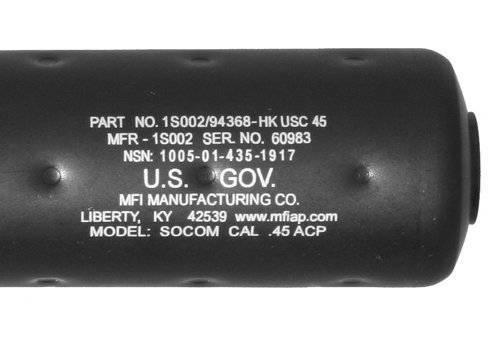 MFI has produced a legal version of the SOCOM Knights Armament Silencer (to meet current BATF specifications for a Fake Silencer / Non-Functional / Cosmetic Only ) here in the USA. MFI has been a Class II BAFT 07 Manufacturer + SOT & a DOD / Military Contractor so we have access to the real thing here to take measurements off of to assure as close a match as possible. The only areas where we deviate from the original in, is that the Depth of the holes are deeper to reduce weight and add a greater 3D effect and the lettering is changed slightly so as not to violate Knights Armament Intellectual Property Rights. The Inner Sleeve is made from aluminum tubing for super light weight. This tubing sandwiched between two PERMANENTLY ATTACHED components keeps with the SPIRIT as well as the LETTER of the law. Maximum Length: = 225.8mm or 8.75 inches. 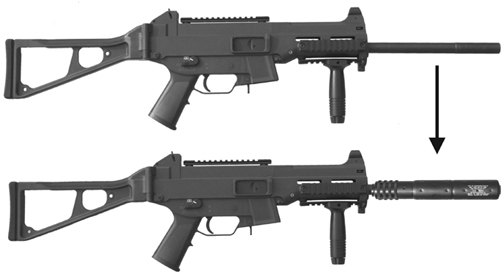 The HK USC45 SOCOM Fake Silencer / Barrel Shroud fits the H&K USC-45 Carbines WITHOUT ANY MODIFICATION. 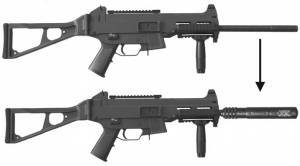 The HK USC 45 SOCOM Fake Silencer slides over your barrel and is held on by 4 nylon tipped set screws. The nylon tipped set screws will not dent your barrel as much as the steel tipped set screws do. This is High Temperature Nylon so they will NOT melt. If you want steel tipped set screws all you have to do is pull the nylon tips off. You can index / position the laser engraving any where you like as the rotation of the outer body is stabilized / stopped by the set screws that makes contact with your barrel.